Investment can be difficult and time consuming, as well as risky. Robo advisors offer a good option for investing, making decision making easier and to some degree removing the uncertainty involved. 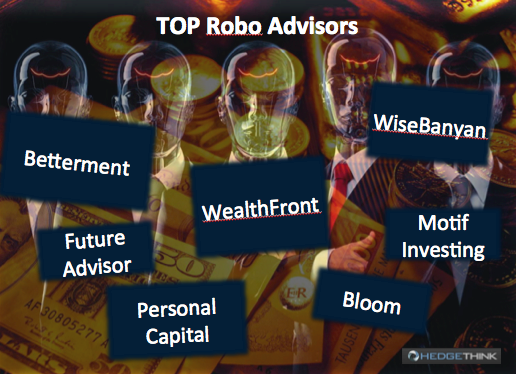 Robo advisors are basically companies that provide automated investment services. They allow people that want to invest to be able to put together a portfolio, invest in ETFs, and do tasks such as reinvesting dividends as well as rebalancing or harvesting tax losses. Robo advisors differ on the basis of cost, whether or not you have to transfer your money to the company’s custodian, the account types, the types of investment, taxes, and whether you can invest in individual stocks or not. According to Rob Berger writing for Forbes, there are seven that are worth a go. Here are his recommended options. Betterment – Betterment was one of the first options ever available in this field. You simply have to choose how much to invest in stock ETFs or bond ETFs. Betterment provides tools to help with this decision making, and it makes the investments in low cost ETFs. It is not necessary to have a minimum deposit to start investing with Betterment, but the more money you can put in, the better your interest rates will be. If you can put in $100,000 or more you will get the lowest rate of 0.15%. The website is well designed and easy to use. WealthFront – this option provides services that are quite similar to those of Betterment. It has a different cost structure and it has a management fee of 0.25% if you have assets valued more than 10,000. You have to put a minimum deposit in of $500 to open an account. With WealthFront your investments could include ETFs that invest in REITs and dividend stocks. If you have $100,000 or more in a taxable account you can also use WealthFront Direct Indexing, which will allow you to buy securities. This is good for tax loss harvesting. WiseBanyan –this robo advisor is particularly good value since it is free. The ETFs charge a fee, and the company generally makes its money by selling add-ons. Tax loss harvesting will be one of those add-ons. Some robo advisors work with current brokerage accounts, meaning that investors are not needed to transfer funds out of the accounts. The advisor manager in this case looks at asset allocation, rebalancing and dividend re-investment from in existing accounts. The below are some of these. FutureAdvisor – FutureAdvisor provides a solid tool for investment evaluation allowing users to hook up their existing accounts with those of FutureAdvisor for free. FutureAdvisor analyses the different investments looking at taxes, fees and diversification. One of the nice things about this tool is that it will go through changes to asset allocation, explaining if some should be sold, and the reasons for this, as well as providing recommendations for what should be bought instead. The investor does not have to take the recommendations made by the robo advisor. Bloom – this is a robo advisor that helps investors to handle 401(k) retirement accounts, one of the only companies to do so. This is complex because it requires the company to be able to work with a massive amount of retirement accounts of this nature, as well as with the investment options available to each 401(k). Bloom has been successful with this, and its users are able to carry out reviews of their investments. Users pay $10 per month and Bloom sets in place the asset allocation recommended, working to keep the plan on track. Active traders are also possible from robo advisor services. One option is Motif Investing. This option is quite similar to a brokerage firm. Its customers can create a motif of stocks and ETFs. A motif is basically a basket. When it is created it is then possible to buy 30stocks and ETFs for just $9.95. It is possible for investors to develop their own motifs, invest in ones proposed by Motif Investing, or invest in motifs that other people using the service have built. Finally, Personal Capital offers a live investment advisor as well as the investment tools. It is recommended for its financial software that allows investors to track their investments. Wealth management services are provided where accounts have at least $100,000 within them. This robo advisor focuses on tactical weighting rather than indexing. Customers can expect to pay 0.89% of assets being managed.